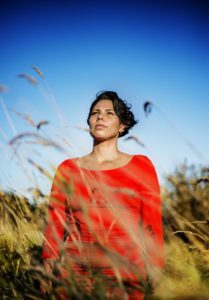 The city’s visual arts scene became even more inclusive with the March 8 news that Lindsay Delaronde has been named Victoria’s inaugural Indigenous Artist in Residence. 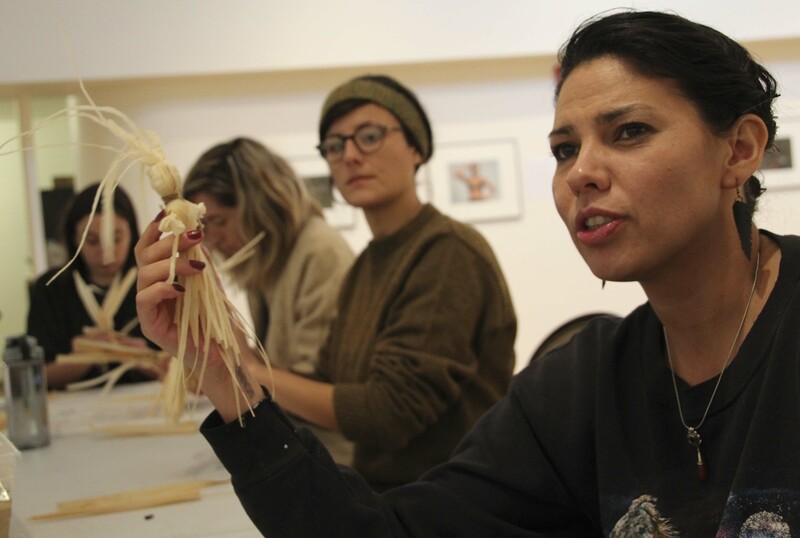 Delaronde, an Iroquois Mohawk woman born and raised on the Kahnawake reservation outside of Montreal, is also a multi‐disciplinary Visual Arts MFA alumna (2010) and has been a professional practicing artist for the past five years. 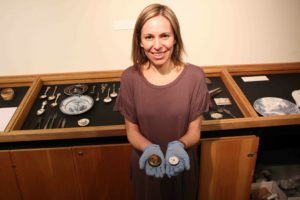 In 2015, she was one of three artists-in-residence at the Royal BC Museum (along with fellow Visual Arts alumnus Gareth Gaudin); her work was in the spotlight with her 2016-17 exhibit In Defiance at UVic’s Legacy Gallery, and she was also a featured speaker at UVic’s Diversity Research Forum in January 2017. Delaronde began making art at a young age, practicing traditional forms of art making such as beadwork and cultural crafts. She began her journey to become a professional artist by travelling to the West Coast and obtaining her BFA at the Emily Carr Institute of Art & Design. She creates work directly related to being an Indigenous woman in contemporary mainstream society, and has worked in mediums ranging from printmaking (including silkscreen printing and photos transfers) to painting, drawing and video — all with the motivation to expand the evolution of Indigenous peoples and their histories. 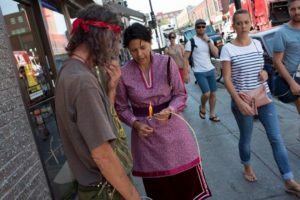 Her intention is to construct Indigenous perspectives within Western society to bring forth truth and reconciliation through the act of creation and visual understanding. 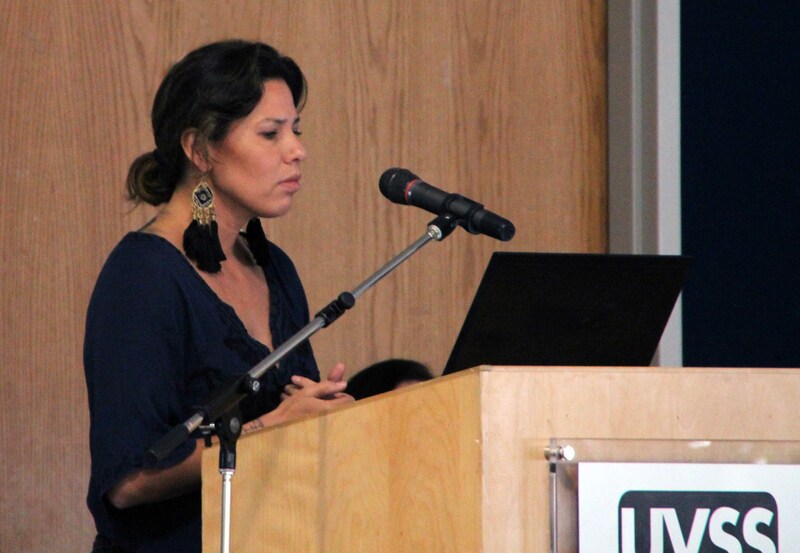 For her one-year term as Indigenous Artist in Residence, Delaronde will work with the community and City staff to produce a range of artistic works; she will also have an opportunity to create collaborative artwork with the City’s Artist in Residence, Luke Ramsey, who was appointed in fall 2016. 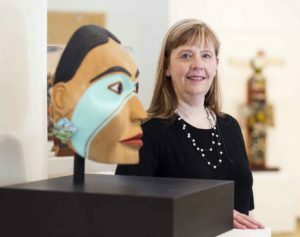 She will work 20 hours per week as an independent contractor (March 2017 to March 2018) for a total fee of $42,000, funded by the City’s Art in Public Places Reserve Fund. Artwork materials, fabrication and installation may be funded by a capital project’s budget, with up to $30,000 from the Art in Public Places Reserve Fund. One of six artists who applied for the position — which was open to First Nations, Inuit and Métis artists and artist teams working in any artistic discipline who reside in the Capital Region, including the Gulf Islands — submissions were evaluated based on artistic excellence, written interest, and knowledge and understanding of the cultural heritage and legacy of the area. Experience with community engagement and a desire to create artwork for and in the public realm were required. Want to get involved? Performers and activated audience members are needed, and you can find out more at an informational meet & greet, 3 to 5pm Sunday, March 19, at Raino Dance, 715 Yates (3rd floor). We’ll be excited to see the impact — both immediate and long-term — this extraordinary Fine Arts graduate has on Victoria during her year of residency. 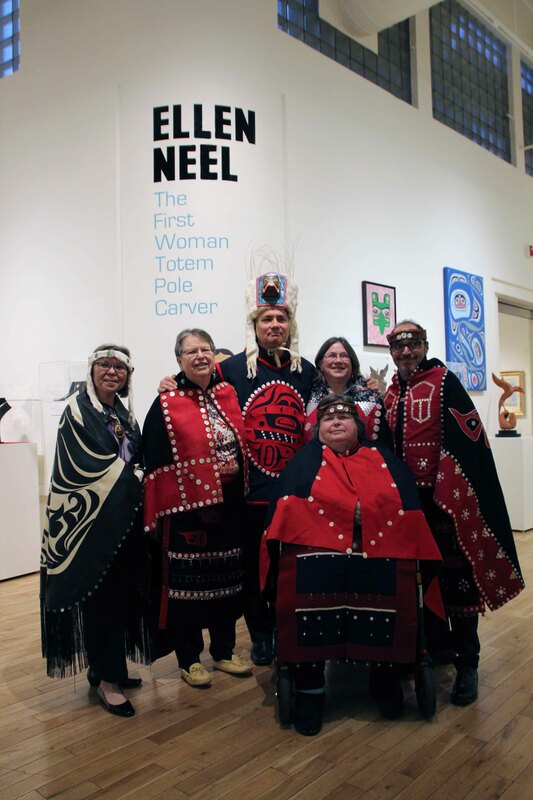 The newest exhibit at UVic’s Legacy Gallery Downtown seeks to correct gendered colonial myths with works by Ellen Neel, a woman carver of the Northwest Coast. Ellen Newman Neel (Kwagiulth, Kwickwasutaineuk and ‘Namgis) is often described as the first Northwest Coast woman carver. A prolific artist, she was only 49 years old when she passed away in the 1960s. 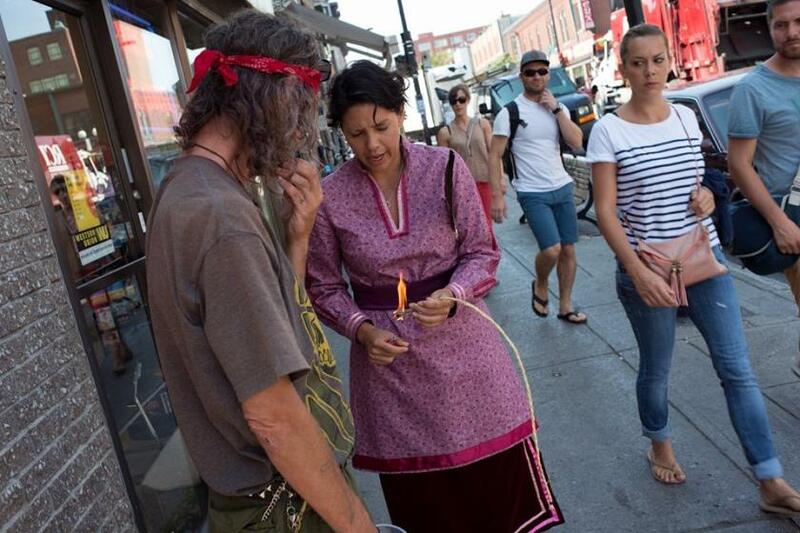 But her defiance of gender barriers and federal law carries deep resonance for all Canadians to this day—and now within the context of the Truth and Reconciliation Committee’s calls to action—and her legendary impact and artistic legacies live on in the work of her children, grandchildren and great-grandchildren. 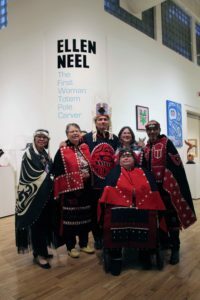 The first exhibition of Neel’s work in more than 50 years is showing at UVic’s Legacy Art Gallery Downtown until April 1. Exhibit co-curator and Art History and Visual Studies professor Carolyn Butler Palmer was assisted throughout the process by two advising curators, David A. Neel (Neel’s grandson and the son of David Lyle Neel) and Lou-ann Ika’wega Neel (her granddaughter and the daughter of Neel’s son Ted). The exhibit includes artwork from six generations of the Neel family, including David’s two children. 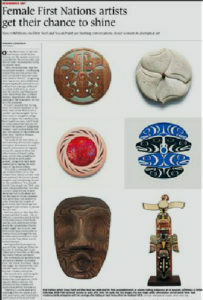 The exhibit was also covered in these articles by both the Times Colonist and Oak Bay News. Born in Alert Bay in 1916, Neel learned during the 1920s to carve from her grandfather—the eminent master carver Yakuglas/Charlie James—at a time when the Indigenous art of carving was banned in Canada under the Indian Act. She then launched her artistic career in the 1940s during the potlatch prohibition when carving was rare and the idea of a woman carver was even rarer still. In 1947, with the ban still in place, Neel established her own carving business. 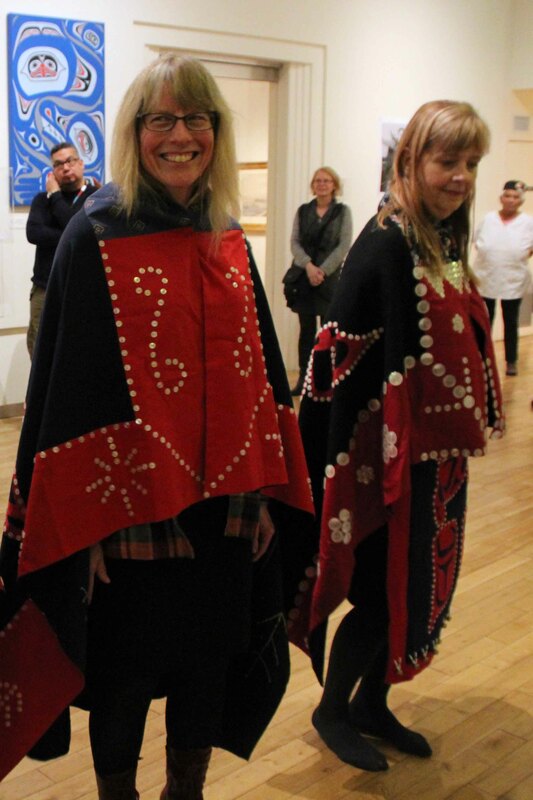 She opened a retail outlet in Stanley Park, The Totem Arts Shop, in 1951 where she taught her children to make art. They carved hundreds of items destined for the tourist market. She also produced monumental and miniature memorial poles, including The Wonderbird Pole of 1953 for White Spot Restaurants, as well as an extensive collection including masks, hand puppets, textiles, jewelry and totemware ceramics. Neel designed the famous Totemland Pole too, which was a commission from a tourism organization with hundreds of the miniature poles gifted to visiting dignitaries, as well as other people beyond BC including Bob Hope and Katharine Hepburn. 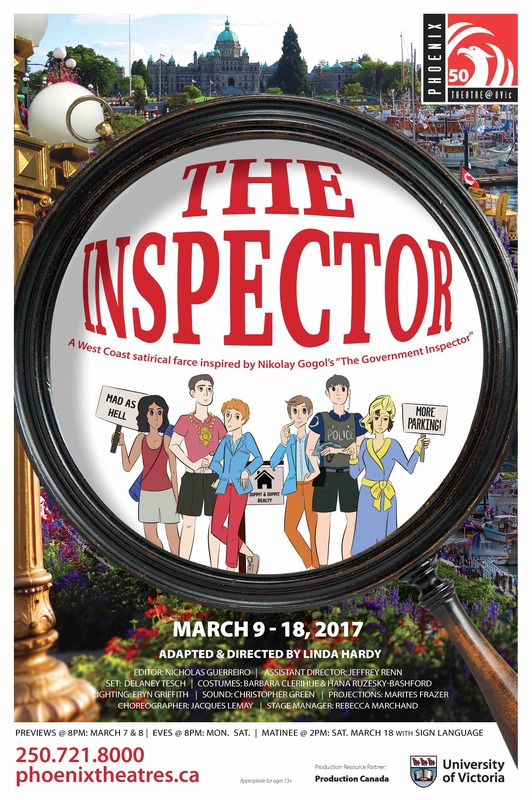 With The Inspector — running March 9 –18 at UVic — Theatre professor Linda Hardy brings Russian playwright Nikolay Gogol’s political farce The Government Inspector into the 21th century. Her new adaptation leaves the plot of the 1836 original intact, but The Inspector places her characters in the fictional west coast town of Paradise. Gogol’s original Russian play, Revizor, was allegedly inspired by a letter from the Russian poet and novelist, Alexander Pushkin; he suggested the basic plot that later appeared in Gogol’s final play: a tale about a town whose officials hear a government inspector is coming incognito. When they mistake a cunning civil servant for “the inspector,” their schemes to cover up their “little failings” are turned against them. His play was such a success that it has been adapted and interpreted many times, including the famous 1949 Danny Kaye film, The Inspector General. 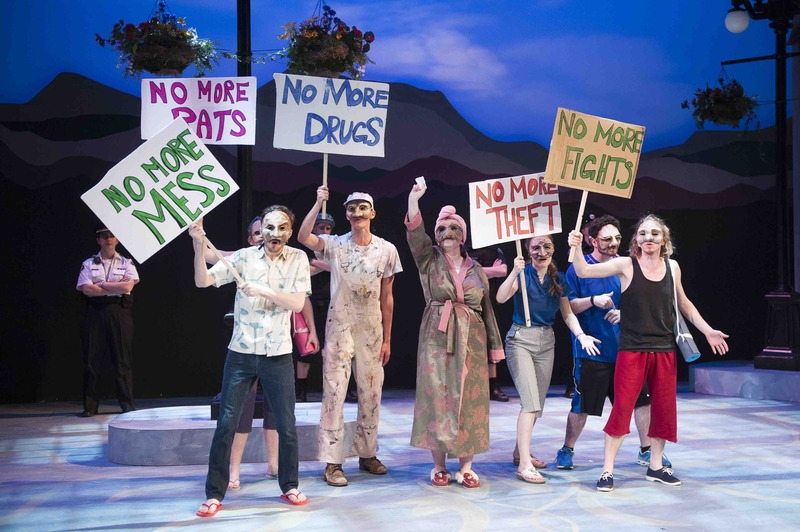 Over five months, local ideas were woven into the new play: the fictional Paradise has to deal with a sewage treatment debacle, concerns about homelessness and a tent city, controversies over new bike lanes . . . audiences should watch for such familiar sights as bike cops, real estate developers, yoga instructors, and plenty of protestors. Gogol’s town had a garbage problem; Paradise has a problem with untreated sewage. Where characters in Gogol’s play complained of the smell of alcohol, Hardy’s West Coast version pokes fun at the plethora of marijuana dispensaries; the officials in the original play are trying to keep “transient characters” from giving the town a bad reputation and appearance, while Hardy’s version raises important questions about the impact of the high costs of living in Paradise. And while there are a lot of serious issues being addressed in The Inspector, Hardy addresses them with the same hilarious manner of Gogol’s farcical satire. While things spin out of control in the play, the cast of 19 theatre students ride bicycles, skateboards, shopping carts and other modes of transportation across iconic Victoria landscapes, dotted with flower-basketed lamp posts, ivy-walled buildings, upscale hotels, and bamboo-fenced gardens — all set in front of a sunset mountain background. Additionally Hardy helps all 35 characters to stand out by incorporating the use of masks, created especially for the play. 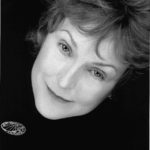 A long-time professor at the Department of Theatre, Linda Hardy is a master teacher of acting and voice who has trained professional actors and singers for stage and film, nationally and internationally. 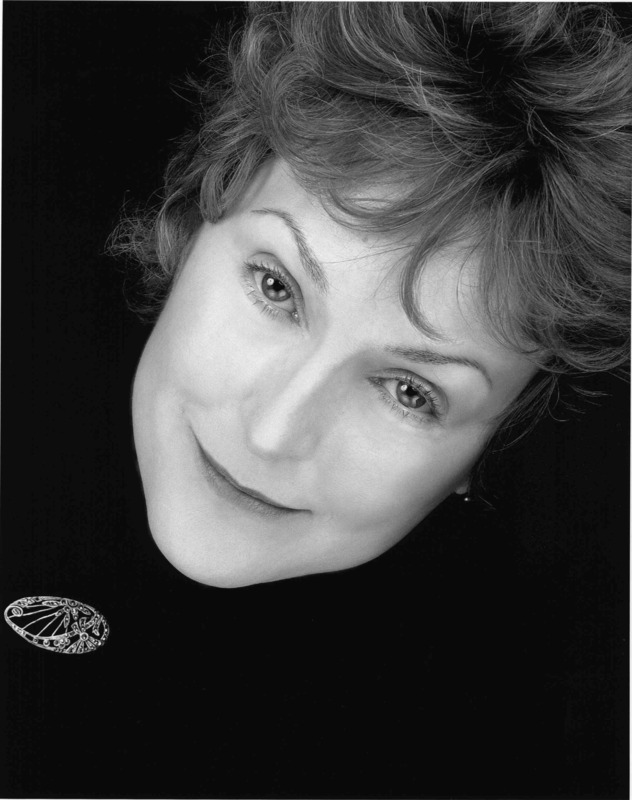 She sees The Inspector as an inspired finale to the department’s 50th season, as well as a gift to the current students. It is only fitting that as we look back over these past 50 years of Phoenix history, The Inspector is inspired by both the past and presents current politics. The Inspector runs March 9 –18 at UVic’s Phoenix Theatre. Tickets range from $15-$26 and are available by phone at 250-721-8000 or in person at the Phoenix box office. There is a 2pm matinee on March 18, which will also feature sign-language interpretation. From Borneo textiles to the world’s largest button blanket, from a 15th century alabaster religious carving to a 19th-century lady’s pocket revolver, from anarchist manifestos to a Jim Carrey movie, the objects studied by art historians continue to change with the times. 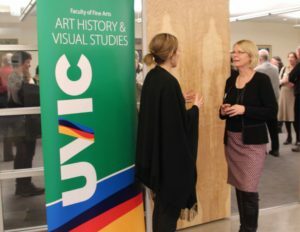 So too does the study of art history itself, as evidenced by the current Legacy Maltwood exhibit Learning Through Looking, celebrating the 50th anniversary of UVic’s Department of Art History and Visual Studies (AHVS). Hatef, a PhD candidate with a focus on Islamic medieval urban architecture, is acutely aware of what can happen when past and present collide; she came to UVic from Iran specifically to study with AHVS professor Marcus Milwright.“I’m looking at transcultural exchanges during 13th and 14th century Iran . . . it’s interesting how people from places like China, Cairo and Damascus talk to each other through the language of art and architecture,” she says. But, as recent events have shown, academic pursuits can easily be threatened by politics — both at home and abroad. It’s these kind of headlines that make the Learning Through Looking exhibit an idea part of the AHVS panel discussion “Why Art Matters in Dangerous Times” at UVic’s Ideafest. 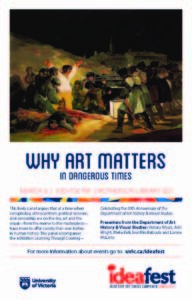 Featuring AHVS professors Victoria Wyatt, Astri Wright, Melia Belli, Evanthia Baboula and Lianne McLarty, this lively panel will discuss how, at a time when (sadly) xenophobia, ethnocentrism, political tensions and censorship are on the rise, art and the visual — from the meme to the masterpiece — have more to offer society than ever before in human history. All are welcome from 5 – 7pm Wednesday, March 8, in room 025 of the McPherson Library (right next door to the exhibit space). 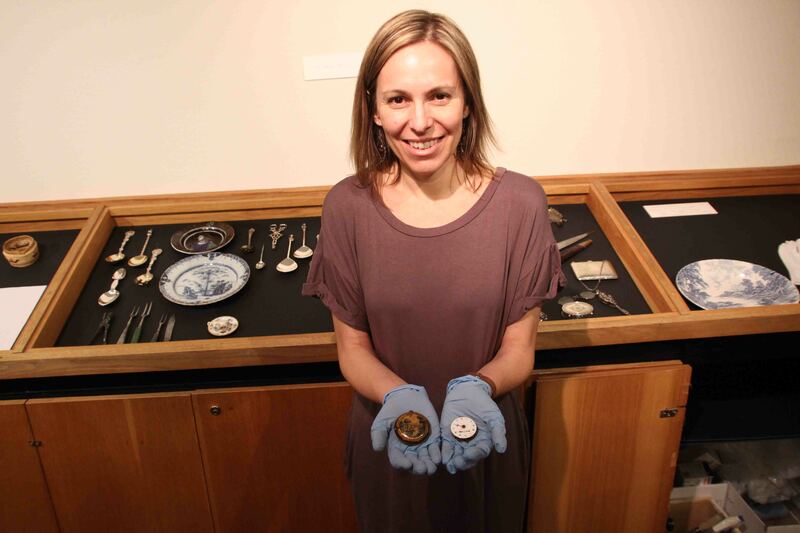 Indeed, given the vast chronological and geographical range of objects on display, the diverse focus of the AHVS teaching faculty is easy to discern. 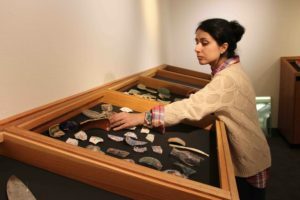 With cases dedicated to the nine full-time professors — as well as the history of the department itself — the exhibit nicely encompasses their global reach while still maintaining a local focus: the community engagement represented by the button blanket project, say, or the juxtaposition of 19th century objects recovered from Swan Lake with pottery shards from medieval Cairo. 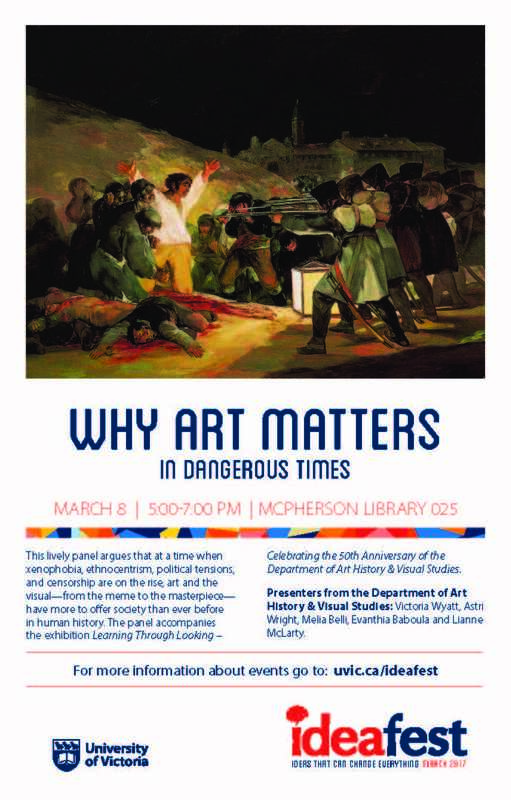 You can learn more about the exhibit at the Curators’ Talk with Hatef, Anka, Campbell and AHVS professors Victoria Wyatt and Astri Wright, 1 – 2 p.m. Tuesday, March 14, in the Legacy Maltwood Gallery on the lower level of McPherson Library.